In this review we are going to have a look at the “Mad Max Profits” binary options scam that is presented by David Finn. This scam is funny because it brings a new story. Finn says that a binary options guru called Max Taylor created a program that can trade binary options for you and make you tons of money. And because Finn’s wife left him for Taylor, he got access to this software legally. Now Finn wants to take his revenge on Taylor, so he will give away this software to 50 lucky people. In one day the date rolls backs several months. OK, enough of fairy tales. Max Taylor nor David Finn do not exist, the entire video is a fake, including the TV news at the beginning. 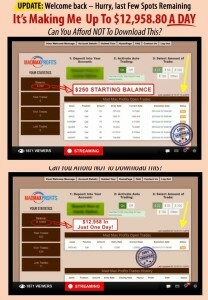 Just look at the Mad Max Profits web page. There are stolen certificates on it from McAfee. The discussion is fake, you cannot like or add any comments. Just fake testimonials. Now let’s get to the video. Finn says that there are only 50 spots available. But just come back another day and you will see that there are always free spots. It is just a mean to put you under pressure. Finn also says that his trading results are verified. But by whom? There are no proofs. In fact, there are proofs of Mad Max Profits being a scam. Just look at the dates. When Finn shows the starting balance, the date is 15th April 2015. When he shows profits after the first day of trading, the date is 21st January 2015. So either he travels back in time, or he is a scammer. One last thing. Look at the disclaimer at the bottom of the Mad Max Profit web site. You will see that all the results are hypothetical. Furthermore you will see an affiliate program. You can make money by referring people to Finn’s page. So yes, it’s just a scam to take money from people. Trading binary options can be profitable, but nobody will trade for you, you have to learn and do it yourself. Only then you will get sustainable profits.